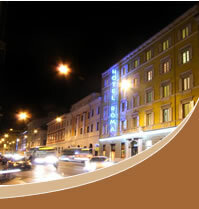 Welcome to the three star Hotel Roma, the most modern hotel in the centre of Trieste in the north of Italy. Here at the Hotel Roma guests are guaranteed comfort, satisfaction and unrivalled customer service. Click on the link below to reach the Hotel Roma Online Real Time Booking Office. Here you can check the availability of rooms for your chosen dates, take advantage of any of the frequent special offers we have available or simply explore the booking process to see how simple it really is. Bookings can be modified or cancelled up to 48 hours in advance and by dealing with us directly all of your information is securely protected. Using the secure booking system to book online presents guests with the best possible rates and up to the minute room availability. The Hotel Roma uses SSL Secured 128bit encryption for maximum security. Staff and management at the Hotel Roma pride themselves on their high level of customer service; guests can be assured of pleasant and efficient multilingual staff willing to help or resolve any quandaries. Our centrally located, picturesque nineteenth century building offers many modern amenities, stylish accommodations, bar and contemporary conference facilities for business travellers. Details of hotel facilities and services can be found on the Rooms & Services page.